Benchmark, a global hospitality company, announces the opening of phase one of The Grove Resort & Spa Orlando, a 106-acre destination resort located near Walt Disney World. Set on Lake Austin, amid a portion of Central Florida’s conservation grounds, The Grove launched with 184 of its 878 residential-style suites. The hotel joins Benchmark Resorts & Hotels, a dynamically expanding portfolio that is part of Benchmark, a global hospitality company that includes 70 domestic and international properties under two brands: Benchmark Resorts & Hotels and the Gemstone Collection. “Benchmark is extremely proud and excited to play a pivotal role in the sustainable development of this dynamic area, just west of Walt Disney World,” Alex Cabañas, CEO of Benchmark, said in a statement. 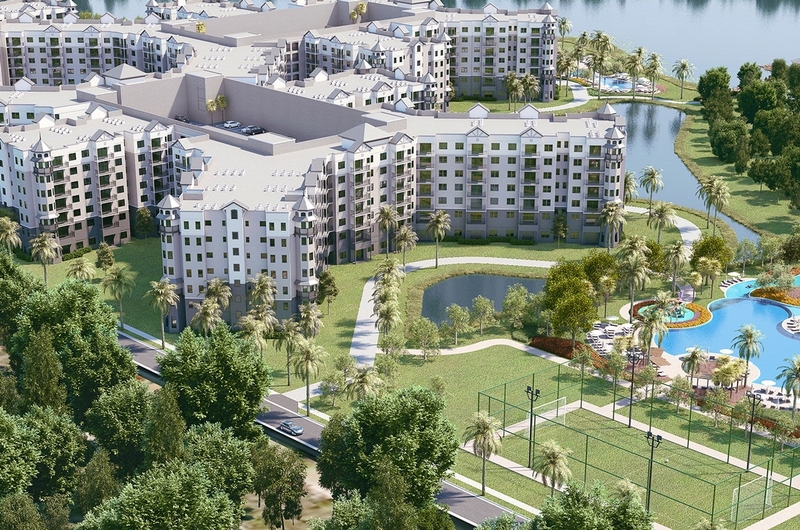 “The Grove will be the first destination resort of its kind to open in what has historically been an underdeveloped area of Orlando.” Cabanas also said The Grove will be Benchmark’s second property in Orlando, joining the Villas of Grand Cypress. Benchmark operates six hotels and resorts in Florida under the Benchmark Resorts & Hotels and Gemstone Collection brands. The Grove Resort & Spa Orlando offers accommodations that span up to nearly 1,600 square feet, matched with an amenity package that will roll out in stages. Opening with three swimming pools, a spa, fitness center, two bars and lounges, a grab-and-go eatery, a lakefront pier with watersports and a children’s game room, The Grove will grow to also include a variety of other dining options and an on-site water park with a dual rider surf simulator, lazy river and multiple water slides. Located 3 miles from Walt Disney World Resort’s Western Way entrance, The Grove is the first hotel of its kind to open on the west side of Disney World. The Grove’s lakefront setting blends with a natural marsh and wooded landscape, and neighbors theme parks and area activities including Magic Kingdom Park, Animal Kingdom Park, Epcot, Disney’s Hollywood Studios, ESPN Wide World of Sports Complex, SeaWorld Orlando, Universal Orlando, shopping, dining and entertainment at Disney Springs, as well as LEGOLAND Florida (Winter Haven). Luxury shopping is also located nearby, with stores such as Gucci, Valentino, Bottega Veneta and more. The resort’s one-, two- and three-bedroom suites range between 1,264 square feet and 1,544 square feet. Each offers a living and dining area, full kitchen, up to three bathrooms, a screened balcony and a full-size washer and dryer. The property also provides 6,000 square feet of indoor meeting and events space, as well as poolside, lawn and garden alfresco venues for meetings or large groups. In total, the resort accommodates up to 250 people with on-site catering and audiovisual support available. The resort’s 221-seat, indoor/outdoor restaurant, Valencia, will arrive in late spring. There, guests will dine on Spanish, Italian and Mediterranean-inspired dishes for breakfast, lunch and dinner. The poolside Springs Bar & Grill, serving traditional bites such as hamburgers, chicken wings and stone brick oven pizzas – all made with fresh, in-season, and locally grown ingredients – will open at the same time. In fall 2017, the on-site Surfari Water Park will take center stage for families with its interactive water structure, multiple slides, more than 725 feet of lazy river and a dual rider surf simulator. Also on deck: an indoor entertainment area and Longboard Bar & Grill, an additional poolside eatery located at Surfari Water Park. Additional guest suites are expected to open in late 2017. The Grove Resort & Spa Orlando is owned by a joint venture between certain affiliates of Westport Capital Partners and BTI Partners, with BTI Partners as the development partner.